Some foods are just divisive. Love it or hate it. This is one of them. But while Asian pickles are my passion, Jewish pickles are my heritage. Kosher dills, straight-up kraut – I love them all as much as a corned beef sandwich and, of course, every smoked and pickled fish I’ve ever met. 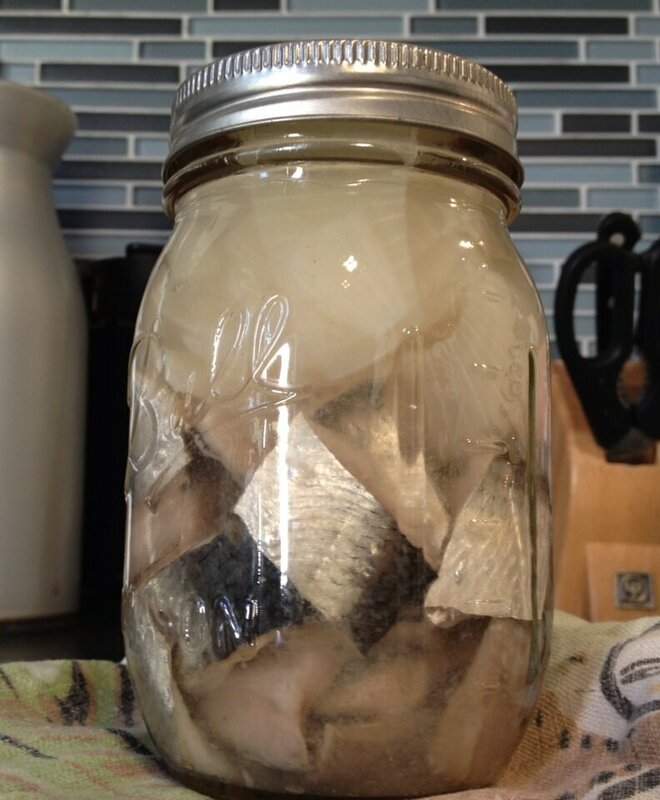 Pickled herring is certainly an acquired taste; the flavor is a strong one if you’re not used to it. But if you like pickles, and you like fish, I think you will find this insanely delicious. Oh, and while herring is a good sustainable choice in seafood, you can also skip the curing process and use the brine to pickle cooked shrimp. It’s a great appetizer on its own, or excellent on top of toast, bagels, or green salad with radishes. Chop the fish into 2.5-3-inch pieces and stack them in a quart-sized jar. Combine the salt and the water and pour it over the fish to cover it completely. Cover, refrigerate, and let it sit in the refrigerator to cure for 8-12 hours. The fish should be firm after curing. Drain the fish of the curing solution and discard. In the bottom of a clean quart jar, layer the bay leaves and the peppercorns with the onion strips and the cured fish, ending with onion on top. Press down on the solids gently to pack them closely together. Combine the vinegar, white wine, water, and sugar and stir until sugar is dissolved. Pour this brine over the packed fish to cover completely. Let the fish sit in the refrigerator for 3-5 days before eating. What is this? Depression Era cooking at its best. My grandmother, Bubby Franks, used to make this often. This is her recipe, passed along to me from my Aunt Simmie, with some minor modifications (Weetabix instead of breadcrumbs; butter instead of margarine.) It is economical, environmentally-sound, and pure nostalgia on a saltine for me, my mom, my brothers and my sister. Eat it warm from the oven or cold from the fridge, either with a fork and knife (as you would a croquette) or spread onto toast or crackers. Oil an 8×8 square Pyrex dish or brownie pan. Preheat the oven to 375 degrees. Drain the herring and discard the brine. In the body of a food processor, pulse the herring and onions from the jar with the apple and the celery until the mixture just combines. In a separate bowl, beat the eggs, then mix with the melted butter and the herring mixture. Add 1 of the Weetabix (or 1/4 cup of the breadcrumbs) and combine until the mixture is somewhat stiff – it should hold its shape like a meatloaf. If it’s still too wet, add additional cereal or crumbs as needed. Stir in the salt and the pepper. Pour the mixture into the prepared pan and smooth the top evenly. Sprinkle with cinnamon and sugar. Bake on the middle oven rack for about 50 minutes. 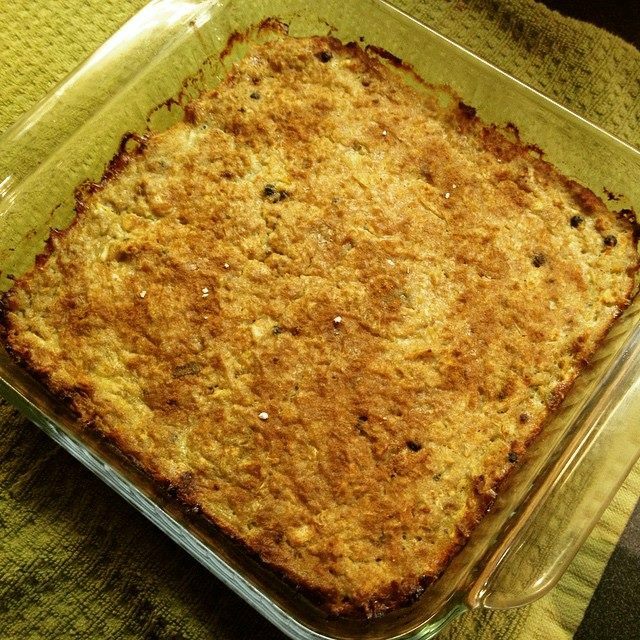 The baked chopped herring is done when the top is golden brown. Let cool 15 minutes before eating. Or, cool and refrigerate until completely cold. Cut into squares and serve on its own or as a spread. 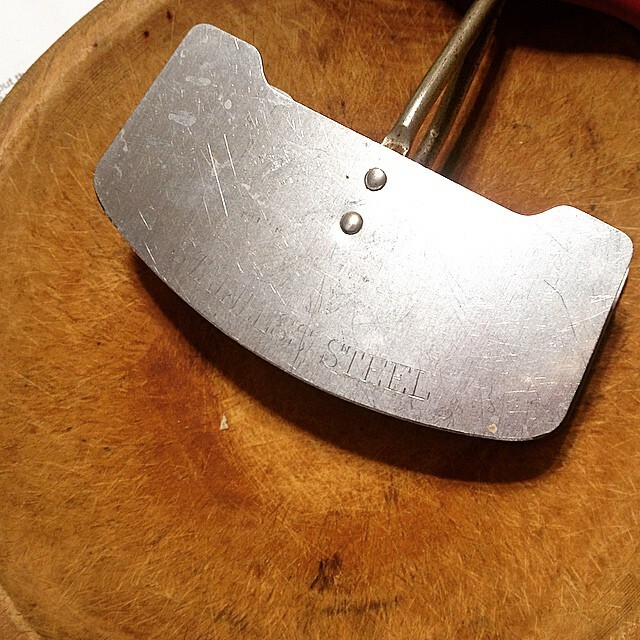 Before the days of food processors, this is what my great grandmother used to make her baked chopped herring. Isn’t technology wonderful?